Take care of cute animals! 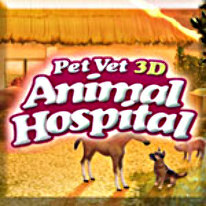 In Pet Vet 3D Animal Hospital, you're in charge your own animal hospital with your very own staff. You will examine various animals and find out what's wrong, then use medical equipment and knowledge to be able to diagnose the problems of your patient and then finally be able to cure them of their sickness. You will even be able to go shopping to pick up yummy foods, pet toys, and vet supplies. Most importantly you will be able to develop relationships with your patients by showing love, affection during playtime.